We have invested in the latest book scanning, digitization and conversion technology. Using a combination of high-end book scanners coupled with cutting-edge OCR, latest e-Book conversion applications and highly advanced image enhancement software, we deliver highest quality and accuracy in the most cost effective way possible. Our scanners are extremely gentle even on the most valuable and fragile books. In addition, we use our own proprietary technology to control, streamline and automate all our scanning operations, from A to Z – ScanFactory Resource Planning (SRP). It was developed entirely in-house by our expert personnel. Its main purpose is to reduce human intervention to an absolute minimum and remove the risk of human error. This highly sophisticated, one-of-a-kind technology offers complete traceability and provides full real-time reporting functionality. The Customer Portal allows you to search for and consult the status of every book processed by ScanFactory at any point in time (e.g. In Transport, in Scanning, etc.). The Portal also makes it possible to make requests for urgent scanning or physical delivery of a particular book, and view full history of such requests. All information and metadata about every single book, including its exact physical location, are stored in the SRP database and can be retrieved on-demand. We can scan your books in two ways, depending on book type, your particular requirements, preferred timeline and budget. The non-destructive method leaves the books completely intact. Also known as In-tact digitization, it involves very careful handling of every book, including turning the pages one by one by hand and even using powder-free gloves whenever necessary. This method is used most commonly by libraries, universities, collectors and museums when the books themselves have value or when they are rare. We have a specialist team who are highly experienced and dedicated to scanning bound volumes. These operators are trained in fragile material handling to ensure precious collections are protected and handled in the correct manner throughout the scanning process. Once scanned and digitized, the books themselves are returned to you intact. The destructive method is most appropriate when your main concern is preserving the information that the book contains, as opposed to the book itself. This involves carefully removing the binding of the book and using a professional guillotine machine, slicing the glued/sown area by around 5mm, then freeing up the pages from any binding and feeding these pages through a high resolution book scanner. Scanned page are shredded. This is a very cost-effective way of archiving, as well as conserving space. For example, a university may wish to make information available to its students without devoting valuable space to multiple copies of texts, theses, and other information that has no inherent physical value, but a great deal of value in terms of information. Your special collections deserve special treatment. Creating archival-quality digital images from your books is not a matter of guesswork. At iGuana, we do not believe in one-size-fits-all approach in general and especially when it comes to your precious books. We understand very well the challenges and intricacies of scanning rare, fragile and unique original items. To provide you with a complete solution, we go beyond simple image capture. We collaborate with you to craft a project plan that meets the specific requirements of your materials, your policies, your timeframe and your budget. With procedures and guidelines in place, we have the whole process down to a science. We place the requirements around the condition of the books, while the speed at which we process them can be reduced to make absolutely sure the books remain in the same condition they came to us. We treat all books we scan with the greatest of respect, but do understand that there will always be a few cases that need special attention. We use only our most experienced book scanning operators to complete this type of work and ensure they always wear powder- free gloves in order to protect the pages and print of your books. Our preservation facility is designed with your special collections in mind. An environmentally controlled, secure storage area ensures that your materials are safely kept in a proper environment while remaining easily accessible for our specialist staff. Every single action that our staff performs in relation to your books is tracked in our SRP system from the moment we pick up your precious materials to the moment they are safely back in your hands. Our Customer Portal offers a real-time view into every step of the scanning process. Every action taken in relation to individual books is tracked in our SRP system in real time. The SRP system has built-in quality control features (as do all book scanners used at ScanFactory). Complex quality control algorithms analyze every single image, flag images that are suspected to have a quality issue and automatically alert our Quality Supervisor to take action. In addition, SRP utilizes a 16-core server dedicated exclusively to post-scan image processing and performs a variety of algorithmic image enhancement functions. Our scanners are extremely gentle even on the most valuable and fragile books. They were developed in close collaboration with experienced users and have been specially designed to capture images from bound volumes facing up, which completely eliminates the need to unbind them (very important, especially if you need to scan materials of historical or cultural value). In addition, our scanning equipment meets the high standard of book restorers i.e. that old and historically valuable books should be scanned with a maximum opening angle of 90º, as opposed to common 180º, 140º or 120º . This 90º V-cradle design minimizes or completely eliminates curvature imparted on the page images during book scanning due to tight bindings while respecting the integrity of the materials. A human operator is in control of 100% of the captures created using this system, which means that it is safe for fragile, oversized, and otherwise difficult to digitize works. Other quality control features include: scanner hoods to prevent glare, control of the immediate environment to maintain colour neutrality, low exposure to light, no UV/IR radiation, automatic positioning of the book, automatic opening of the glass plate and automatic lowering of the book support plates after scanning, automatic start of scan, electronically controlled book pressure (continuously adjustable in 5 steps for protection of the documents), 3D scan technology for perfect book curve correction, true colour processing, up to 600 dpi resolution, etc. We are prepared to meet your indexing requirements from start to finish. We can provide structural, technical, administrative, as well as preservation metadata and format it just the way you want it (as simple or as elaborate as you require). We can index your materials by matching to any existing databases, by manual keying, or other methods. Items with consistent, printed text can be processed for OCR (e.g. for text searchable PDF files), newspapers and other serials can be segmented at article level, bound or grouped materials can be combined into multi-page files or collections, etc. We will also prepare images and index information for import into your back-end databases or document management software. What would you like us to do with your books once scanned? Our team of experts will convert any book type into a perfect digital book that is user-friendly and compatible with any reading device like Kindle, Kindle DX, Sony Reader, Noble Nook, Kobo e-Reader, iPhone, Adobe digital edition, etc. 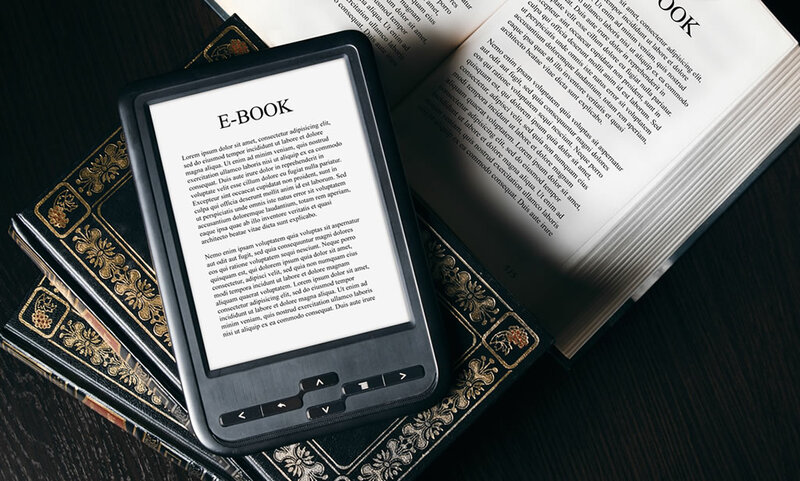 Make your hard copies soft with our eBook conversion services!